Some frequent questions about Annual General Meetings answered. We are coming up to, what at Pigott Stinson we call, “AGM season”. That is, our weekends throughout March, April and May are spent attending Annual General Meetings (AGMs) at clubs throughout NSW. It is actually one of the more enjoyable parts of the job where we get out of the office and see how clubs are doing, while answering questions in relation to resolutions or the rules of meetings. 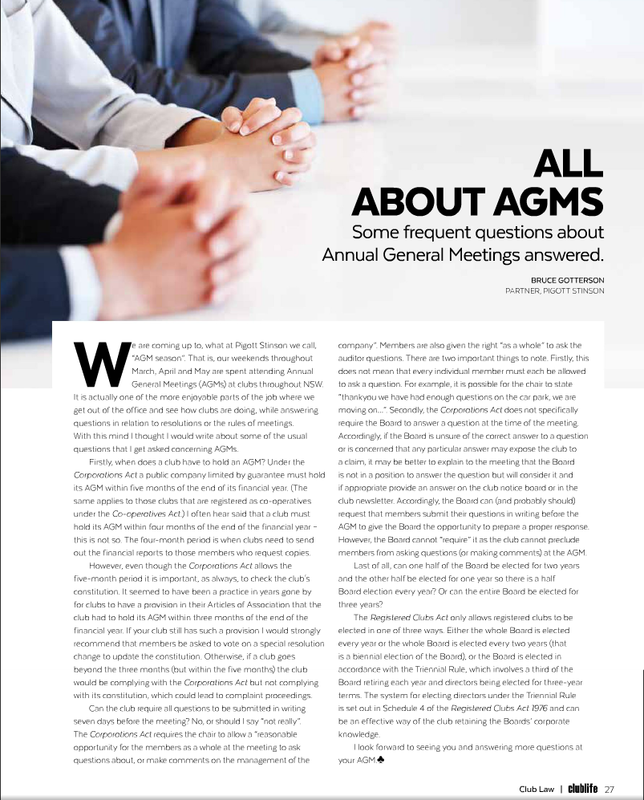 With this mind I thought I would write about some of the usual questions that I get asked concerning AGMs. Firstly, when does a club have to hold an AGM? Under the Corporations Act a public company limited by guarantee must hold its AGM within five months of the end of its financial year. (The same applies to those clubs that are registered as co-operatives under the Co-operatives Act.) I often hear said that a club must hold its AGM within four months of the end of the financial year – this is not so. The four-month period is when clubs need to send out the financial reports to those members who request copies. However, even though the Corporations Act allows the five-month period it is important, as always, to check the club’s constitution. 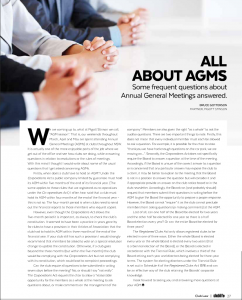 It seemed to have been a practice in years gone by for clubs to have a provision in their Articles of Association that the club had to hold its AGM within three months of the end of the financial year. If your club still has such a provision I would strongly recommend that members be asked to vote on a special resolution change to update the constitution. Otherwise if a club goes beyond the three months (but within the five months) the club would be complying with the Corporations Act but not complying with its constitution, which could lead to complaint proceedings. Can the club require all questions to be submitted in writing seven days before the meeting? No, or should I say “not really”. The Corporations Act requires the chair to allow a “reasonable opportunity for the members as a whole at the meeting to ask questions about, or make comments on the management of the company”. Members are also given the right “as a whole” to ask the auditor questions. There are two important things to note. Firstly, this does not mean that every individual member must each be allowed to ask a question. For example, it is possible for the chair to state “thankyou we have had enough questions on the car park, we are moving on…” Secondly, the Corporations Act does not specifically require the Board to answer a question at the time of the meeting. Accordingly, if the Board is unsure of the correct answer to a question or is concerned that any particular answer may expose the club to a claim, it may be better to explain to the meeting that the Board is not in a position to answer the question but will consider it and if appropriate provide an answer on the club notice board or in the club newsletter. Accordingly, the Board can (and probably should) request that members submit their questions in writing before the AGM to give the Board the opportunity to prepare a proper response. However, the Board cannot “require” it as the club cannot preclude members from asking questions (or making comments) at the AGM. Last of all, can one half of the Board be elected for two years and the other half be elected for one year so there is a half Board election every year? Or can the entire Board be elected for three years? The Registered Clubs Act only allows registered clubs to be elected in one of three ways. Either the whole Board is elected every year or the whole Board is elected every two years (that is a biennial election of the Board), or the Board is elected in accordance with the Triennial Rule, which involves a third of the Board retiring each year and directors being elected for three-year terms. The system for electing directors under the Triennial Rule is set out in Schedule 4 of the Registered Clubs Act 1976 and can be an effective way of the club retaining the Boards’ corporate knowledge. I look forward to seeing you and answering more questions at your AGM. Click on the image below to see the article as it appeared in Club Life February 2015.